When to use: Usually entered when market is near A and user expects a slight to moderate rise in market but sees a potential for sell-off. 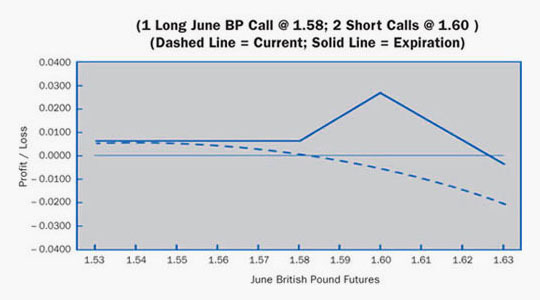 One of the most common option spreads, seldom done more than 1:3 (two excess shorts) because of upside risk. Profit characteristics: Maximum profit, is equal to B – A – net cost of position (for call-vs.-call version), realized if market is at B at expiration or B – A + net credit of position (if long option premium is less than premium collected from the sale of two or more options). Loss characteristics: Loss limited on downside (to net cost of position in call-vs.-call, or no loss if position established at a credit) but open-ended if market rises. Rate of loss, if market rises beyond strike price B, is proportional to number of excess shorts in position. 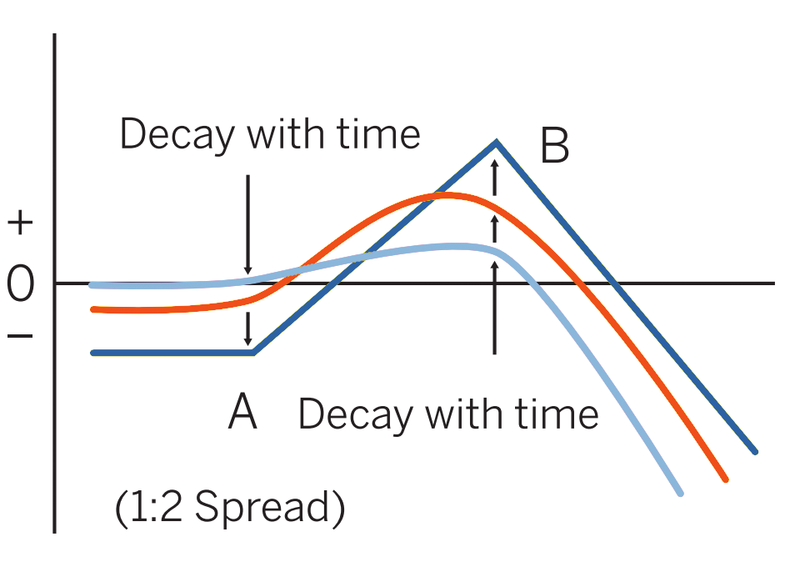 Decay characteristics: Depends on the net time value purchased or sold via this strategy. If more time value sold than bought, then time value decays works to the benefit of the holder of this strategy. This trader finds current implied volatility at relatively high levels. Analysis of this market leads this trader to conclude that British Pound futures will trend very slowly up to about $1.60/pound. Also, there is a small chance that the pound may fall dramatically. The trader, therefore, likes the risk/reward profile of the ratio call spread with this outlook. Breakeven: 1.6260 (1.6000 strike + 0.02 difference between strikes + 0.0060 credit). Loss Risk: Unlimited; losses continue to mount as futures rise above 1.6260. Potential Gain: Maximum gain of 0.0260 ($1625.00) peaks at 1.6000 strike. Do not enter into this position when there is a chance of an explosive upward move. In this particular situation, a profit is realized if futures fall. However, depending on the strikes chosen, a small loss may also occur.